Also serving communities of Los Alamos, Serafina, Las Vegas. The average cost of assisted living in Santa Fe is $3,635 per month. This is higher than the national median of $3,346. To help you with your search, browse the 42 reviews below for assisted living facilities in Santa Fe. On average, consumers rate assisted living in Santa Fe 4.2 out of 5 stars. Caring.com has helped 6 families in Santa Fe find high-quality senior care. To speak with one of our Family Advisors about assisted living options and costs in Santa Fe, call (855) 863-8283. The city of Santa Fe is the fourth largest city in the state of New Mexico and has a population of 82,927. Around 26 percent of the population is aged 60 and up. To accommodate this sizable senior community, Santa Fe offers seven local assisted living facilities (ALFs) to help provide residents with assistance on activities of daily living (ADLs), medication management and social activities. Each facility is licensed and regulated by the New Mexico Department of Health, Division of Health Improvement, Health Facility Licensing and Certification Bureau. Residents may find the cost of living difficult to manage in Santa Fe, which is rated a 117 compared to the national average of 100 and the state median of 95. This higher cost is due primarily to an increased housing market, which may not be problematic for seniors. Low-income seniors can save money on expenses like groceries, health care, utilities and transportation compared to both the national and state averages. Locals in Santa Fe experience lower violent crime rates by 74 percent and property crimes by 2.1 percent. However, seniors should consider the 188 percent increased crimes per square mile compared to other cities in New Mexico before moving here, making it only 18 percent safer than those communities. Seniors living in Santa Fe may find it difficult to manage the cold nighttime temperatures that have average year-round lows between 17 and 54 degrees. However, with little rainfall and short winters, residents may be able to participate in more outdoor daytime activities than those in other areas. The city of Santa Fe is known for its exceptional air quality, which the air quality index registers as 17 percent better than the national average. Additionally, 85 percent better pollution levels make it easier for seniors with respiratory illnesses to breathe. The Santa Fe area is home to world-class medical facilities, including CHRISTUS St. Vincent Regional Medical Center, Santa Fe Indian Hospital and The Endoscopy Center of Santa Fe, in the event of medical emergencies or illness. Santa Fe has an array of community resources for seniors, including the Division of Senior Services, an organization that helps seniors remain active in their community and promotes independent living through recreational opportunities and social events at several local senior centers. Assisted Living costs in Santa Fe start around $3,635 per month on average, while the nationwide average cost of assisted living is $4,000 per month, according to the latest figures from Genworth’s Cost of Care Survey. It’s important to note that assisted living rates in Santa Fe and the surrounding suburbs can vary widely based on factors such as location, the level of care needed, apartment size and the types of amenities offered at each community. 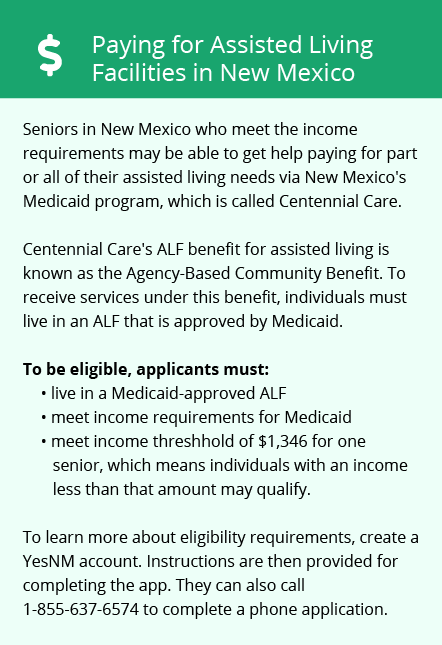 Eligible seniors in Santa Fe can receive aid through the Centennial Care program and Supplement Security Income (SSI). Santa Fe and the surrounding area are home to numerous government agencies and non-profit organizations offering help for seniors searching for or currently residing in an assisted living community. These organizations can also provide assistance in a number of other eldercare services such as geriatric care management, elder law advice, estate planning, finding home care and health and wellness programs. To see a list of free assisted living resources in Santa Fe, please visit our Assisted Living in New Mexico page. Santa Fe-area assisted living communities must adhere to the comprehensive set of state laws and regulations that all assisted living communities in New Mexico are required to follow. Visit our Assisted Living in New Mexico page for more information about these laws.